SkillsUSA is a student run organization, whereby student members are charged with the responsibility of governing the affairs associated with the student constitutions. States are entitled to student voting delegates commensurate with their membership to represent the views of their state association within the structure of the National House of Delegates. National House of Delegate sessions are conducted in a business meeting setting. There are three houses of voting delegates: college/postsecondary, high school and middle school. 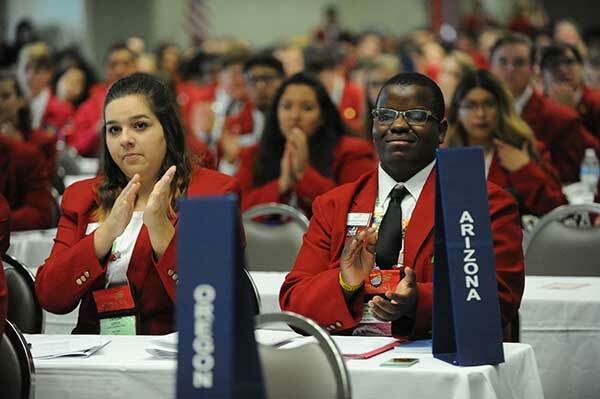 Over 650 young adults, who are geographically diverse and hold various leadership roles within their SkillsUSA chapters, come together to conduct the business of SkillsUSA. The duties of the voting delegates are important to the operation of the organization. Therefore, the selection process for voting delegates must be seriously considered to assure that the voting delegates are aware of their duties and will carry them out diligently. Act upon items of business as requested by the National Executive Council and Board of Directors. NOTE: Because of the Delegate schedule during NLSC, it is not recommended for contestants to serve as delegates. A national officer candidate may serve as a delegate and vote but may not be seated in the House of Delegates meetings during campaign speeches and problematic questions. Each state association is entitled to send delegates to the NLSC based on the state’s membership for the year. Please locate the Delegate Count Guide in the Resources area for determining the number of delegates allowed. This guide is to be used for middle school, high school and college/postsecondary divisions.